Corey is using Smore newsletters to spread the word online. Students will identify an integer and its opposite and use integers to represent real world situations. Please complete 5 problems from each topic in IXL. You also received paper copies to work on as well that was sent home with parent letter. Fun math practice! Improve your skills with free problems in 'Understanding integers' and thousands of other practice lessons. Fun math practice! Improve your skills with free problems in 'Absolute value and opposite integers' and thousands of other practice lessons. Fun math practice! 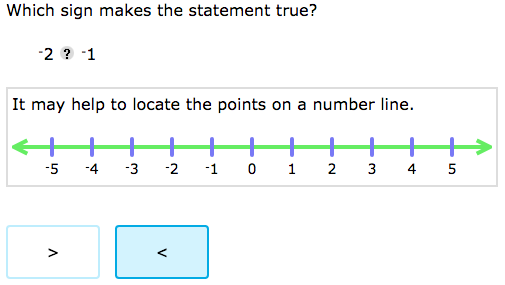 Improve your skills with free problems in 'Integers on number lines' and thousands of other practice lessons. Fun math practice! Improve your skills with free problems in 'Compare and order integers' and thousands of other practice lessons. Please log onto ALEKS and take quiz. The quiz is entitled 6th Grade E-Learning Day: Understanding Integers. Your username and password will be attached to the parent packet for those of you who might need the reminder. To get to the quiz, you will click on the three lines in the upper left corner of the screen. Click on assignments and your quiz should be listed there. Provides a complete web based educational environment for K-12 and Higher-Education mathematics, accounting, statistics, and chemistry. Explore the following if you need additional help understanding this lesson!